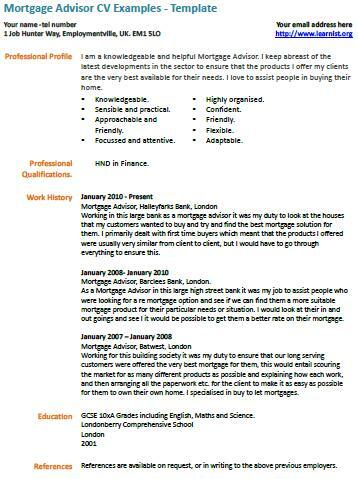 Mortgage Advisor CV Example – Template. Amend as suitable and start creating your own CV in minutes and apply for latest job vacancies. It’s important for you not to just copy paste and use this CV as a CV must be completely unique to yourself. Mortgage advisor jobs can be found on the major job sites online. – Mortgage Advisor cover letter example! If an interview coming soon for you then why not check out our typical interview questions and answer section? I am a knowledgeable and helpful Mortgage Advisor. I keep abreast of the latest developments in the sector to ensure that the products I offer my clients are the very best available for their needs. I love to assist people in buying their home. Working in this large bank as a mortgage advisor it was my duty to look at the houses that my customers wanted to buy and try and find the best mortgage solution for them. I primarily dealt with first time buyers which meant that the products I offered were usually very similar from client to client, but I would have to go through everything to ensure this. Mortgage Advisor, Barclees Bank, London. As a Mortgage Advisor in this large high street bank it was my job to assist people who were looking for a re mortgage option and see if we can find them a more suitable mortgage product for their particular needs or situation. I would look at their in and out goings and see I it would be possible to get them a better rate on their mortgage. Working for this building society it was my duty to ensure that our long serving customers were offered the very best mortgage for them, this would entail scouring the market for as many different products as possible and explaining how each work, and then arranging all the paperwork etc. for the client to make it as easy as possible for them to own their own home. I specialised in buy to let mortgages.